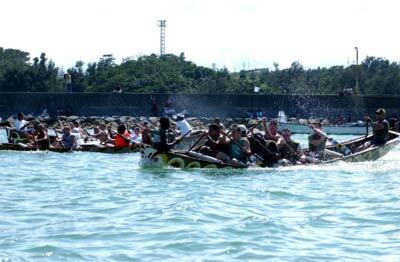 HENOKO, OKINAWA, Japan — The verbal commands of ‘Stroke, stroke, stroke’ echoed through the air in rhythm with the sound of beating drums during the 103rd Annual Hari Dragon Boat Races at Matsuda-no Hama Beach here May 30. 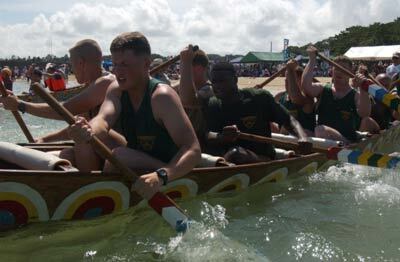 Eight teams of Marines and sailors from Camp Schwab and Camp Hansen participated in the sea-faring event, paddling to stay afloat against a strong field of local competitors. Originating more than 200 years ago, the purpose of dragon-boating was to ask the god of the sea for an abundant harvest of fish for the coming year. In the modern era, the races also serve as an opportunity for Okinawans to share their culture with service members stationed here, according to Epperson. Many of the service members practiced weeks in advance to hone their skills and surprise the competition. The teams paddled 440 meters, gliding through the finish line with average times of about four minutes. The 3rd Recon Marines started off slowly and veered in the wrong direction, but they nearly caught up to the other boats after making their turn around the buoy. Synchronization was the key to maximize the thrust of the boat, explained participant Petty Officer 3rd Class Chad Minks, a corpsman from Sunman, Ind., assigned to 3rd Medical Battalion, 3rd Force Service Support Group. “Body size didn’t mean anything, but teamwork was everything,” he said. 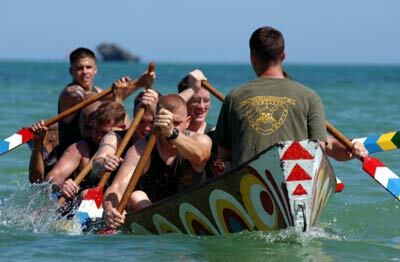 Although none of the teams of Marines and sailors paddled to victory, they did surprise spectators by sinking three boats throughout the races. “The funny thing about Marine teams is they are the ones who tend to capsize.” Epperson said. With the offering to the god of the sea completed, the service members were invited to join local residents for food and spirits, bringing closure to the event.